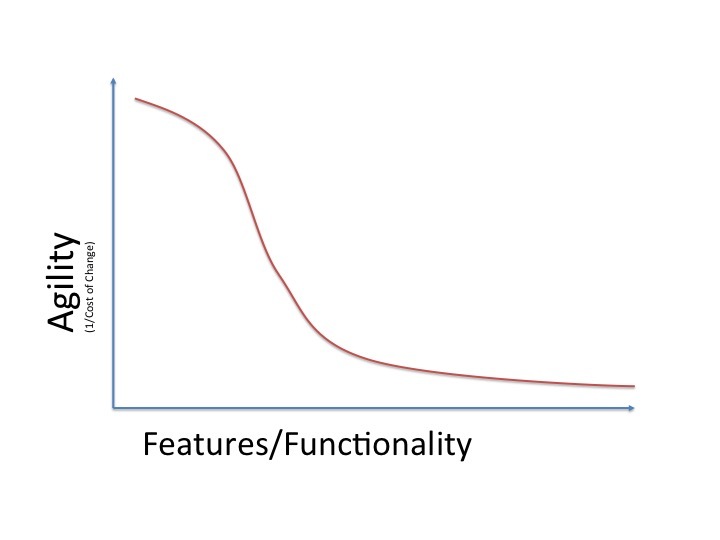 From an architectural perspective, Agile methodologies are heavily dependent on business- (or function-) aligned product owners, which tend to be very focused on *their* priorities – and not the enterprise’s priorities (i.e., other functions or businesses that may benefit from the work the team is doing). This results in very inward-focused development, and where dependencies on other parts of the organisation are identified, these (in the absence of formal architecture governance) tend to be minimised where possible, if necessary through duplicative development. And other teams requiring access to the team’s resources (e.g., databases, applications, etc) are served on a best-effort basis – often causing those teams to seek other solutions instead, or work without formal support from the team they depend on. This, of course, leads to architectural complexity, leading to reduced agility all round. If we accept the premise that, from an architectural perspective, teams are the main consideration (it is where domain and technical knowledge resides), then the question is how to get the right demand to the right teams, in as scalable, agile manner as possible? In agile teams, the product backlog determines their work schedule. The backlog usually has a long list of items awaiting prioritisation, and part of the Agile processes is to be constantly prioritising this backlog to ensure high-value tasks are done first. Well known management research such as The Mythical Man Month has influenced Agile’s goal to keep team sizes small (e.g., 5-9 people for scrum). So when new work comes, adding people is generally not a scalable option. So, how to reconcile the enterprise’s needs with the Agile team’s needs? 20% may seem like a lot – especially when there is so much work to be done for immediate priorities – but it cuts both ways. If *every* team allows 20% of their backlog to be for other teams, then every team has the possibility of using capacity from other teams – in effect, increasing their capacity by much more than they could do on their own. And by doing so they are helping achieve enterprise goals, reducing overall complexity and maximising reuse – resulting in a reduction in project schedule over-runs, higher quality resulting architecture, and overall reduced cost of change. The concept of ‘Slack’ is well described in the book ‘Slack: Getting Past Burn-out, Busywork, and the Myth of Total Efficiency‘. In effect, in an Agile sense, we are talking about organisational slack, and not team slack. Teams, in fact, will continue to be 100% utilised, as long as their backlog consists of more high-value items then they can deliver. The backlog owner – e.g., scrum master – can obviously embed local team slack into how a particular team’s backlog is managed. Project managers are used to getting funding to deliver a project, and then to be able to bring all those resources to bear to deliver that project. The problem is, that is neither agile, nor does it scale – in an enterprise environment, it leads to increasingly complex architectures, resulting in projects getting increasingly more expensive, increasingly late, or delivering increasingly poor quality. It is difficult for a project manager to accept that 20% of their budget may actually be supporting other (as yet unknown) projects. So perhaps the solution here is to have Enterprise Architecture account for the effective allocation of that spending in an agile way? (i.e., based on how teams are prioritising and delivering those enterprise items on their backlog). An idea worth considering.. Note that the situation is a little different for planned cross-business initiatives, where product owners must actively prioritise the needs of those initiatives alongside their local needs. Such planned work does not count in the 20% enterprise allowance, but rather counts as part of how the team’s cost to the enterprise is formally funded. It may result in a temporary increase in resources on the team, but in this case discipline around ‘staff liquidity’ is required to ensure the team can still function optimally after the temporary resource boost has gone. The challenge regarding project-oriented financial planning is that, once a project’s goals have been achieved, what’s left is the team and underlying architecture – both of which need to be managed over time. So some dissociation between transitory project goals and longer term team and architecture goals is necessary to manage complexity. For smaller, non-strategic projects – i.e., no incoming enterprise dependencies – the technology can be maintained on a lights-on basis. Enterprise architecture can be seen as a means to asses the relevance of a team’s work to the enterprise – i.e., managing both incoming and outgoing team dependencies. The higher the enterprise relevance of the team, the more critical the team must be managed well over time – i.e., team structure changes must be carefully managed, and not left entirely to the discretion of individual managers. By ensuring that every project that purports to be Agile has a mandatory allowance for enterprise resource requirements, teams can have confidence that there is a route for them to get their dependencies addressed through other agile teams, in a manner that is independent of annual budget planning processes or short-term individual business priorities. The effectiveness of this approach can be governed and evaluated by Enterprise Architecture, which would then allow enterprise complexity goals to be addressed without concentrating such spending within the central EA function. In summary, to effectively scale agile, an effective (and possibly rethought) enterprise architecture capability is needed. One of the biggest challenges anyone involved in technology has is in balancing the need to address the immediate requirement with the need to prepare for future change at the risk of over-engineering a solution. The wrong balance over time results in complex, expensive legacy technology that ends up being an inhibitor to change, rather than an enabler. It should not be unreasonable to expect that, over time, and with appropriate investment, any firm should have significant IT capability that can be brought to bear for a multitude of challenges or opportunities – even those not thought of at the time. Unfortunately, most legacy systems are so optimised to solve the specific problem they were commissioned to solve, they often cannot be easily or cheaply adapted for new scenarios or problem domains. The net result is that the technology platform already in place is optimised to cope with existing business models and practices, but generally incapable of (cost effectively) adapting to new business models or practices. To address this needs some forward thinking: specifically, what capabilities need to be developed to support where the business needs to be, given the large number of known unknowns? (accepting that everybody is in the same boat when it comes to dealing with unknown unknowns..). These capabilities are generally determined by external factors – trends in the specific sector, technology, society, economics, etc, coupled with internal forward-looking strategies. Data governance and data architecture need to be optimised in order to enhance the quality, accuracy and integrity of data. Analytical and reporting processes need to facilitate faster decision-making and direct availability of the relevant information. Processes and databases for the areas of finance, control and risk need to be harmonised. Increased automation of the data exchange processes with the supervisory authorities is required. Fast and flexible implementation of supervisory requirements by business units and IT necessitates a modular and flexible architecture and appropriate project management methods. The interesting aspect about the above capabilities is that they span multiple businesses, products and functional domains. Yet for the most part they do not fall into the traditional remit of typical IT organisations. The current state of technology today is capable of delivering these requirements from a purely technical perspective: these are challenging problems, but for the most part they have already been solved, or are being solved, in other industries or sectors – sometimes in a larger scale even than banks have to deal with. However, finding talent is, and remains, an issue. The big challenge, rather is in ‘business-technology’. That amorphous space that is not quite business but not quite (traditional) IT either. This is the capability that banks need to develop: the ability to interpret what outcomes a business requires, and map that not only to projects, but also to capabilities – both business capabilities and IT capabilities. Analytics & Reporting Application of Big Data techniques for scaling timely analysis of large data sets, not only for reporting but also as part of feedback loops into automated processes. Data science approach to analytics. Processes & Databases Use of meta-data in exposing capabilities that can be orchestrated by many business-aligned IT teams to support specific end-to-end business processes. Databases only exposed via prescribed services; model-driven product development; business architecture. It should be obvious looking at this list that it will not be possible or feasible to outsource these capabilities. Individual capabilities are not developed isolation: they complement and support each other. Therefore they need to be developed and maintained in-house – although vendors will certainly have a role in successfully delivering these capabilities. And these skills are quite different from skills existing business & IT folks have (although some are evolutionary). Nobody can accurately predict what systems need to be built to meet the demands of any business in the next 6 months, let alone 3 years from now. But the capabilities that separates the winners for the losers in given sectors are easier to identify. Banks in particular are under massive pressure, with regulatory pressure, major shifts in market dynamics, competition from smaller, more nimble alternative financial service providers, and rapidly diminishing technology infrastructure costs levelling the playing field for new contenders. Regulators have, in fact, given banks a lifeline: those that heed the regulators and take appropriate action will actually be in a strong position to deal competitively with significant structural change to the financial services industry over the next 10+ years. The changes (client-centricity, digital transformation, regulatory compliance) that all knowledge-based industries (especially finance) will go through will depend heavily on all of the above capabilities. So this is an opportunity for financial institutions to get 3 for the price of 1 in terms of strategic business-IT investment. The ‘term’ digital is bandied around quite a lot, so it is useful to be quite precise about what is meant by it. Customer- or client-centricity – this is about understanding the client’s needs, and in effect providing the whole capability of the organisation to meet the client’s needs effectively and efficiently. The client is assumed to be the primary source of revenue, and the balance between meeting the firm’s wants (i.e., to get clients and to make as much money as possible from them) and the client’s needs (i.e., to get the service they need) will very much shape any client-centricity programme. Many ‘digital’ efforts tend to focus exclusively on this space, as this involves big data, social, mobile, etc, etc. It is about building (mobile or traditional desktop) applications to meet client needs, it is about providing clients a richer user experience, it is about clients being able to interact with the firm through a single portal tuned for their needs, and not the firm’s own wants. It is about joining processes and functions which historically have acted as islands. Client-centricity efforts are usually led by the CEO and/or the COO. Data is an asset implies you ‘know what you got’ in terms of knowing what data the firm has and where. This is becoming a bigger priority for more and more firms, as they realise that key strategic goals such as knowing your client’s needs, meeting demanding regulatory obligations or improving operational excellence are all but impossible to achieve without some stewardship of the vast amounts of data that the organisation captures every day. Stewardship means putting in place principles, practices and tools to allow data to be discovered and accessed when and where it is needed, and to avoid the creation of redundant or duplicative processes or systems. Data stewardship needs to be led at the level of COO at least, and potentially CEO. Business agility is the ability to rapidly and sustainably respond to change. Many businesses have been agile in the past, in the sense that they see market opportunities and do the work needed to take advantage of it, usually within a 1 year timeframe and often much less. However, as the complexity in an organisation grows, the ability to respond rapidly to change decreases, until eventually sclerotic processes and systems force a massive re-investment in technology with the corresponding high cost and high risk. So maintaining business agility is a complexity management activity: first to control the complexity and then to manage it. As with the others, business agility needs to be led at the level of COO at least, and potentially CEO. It should not be the responsibility of the CIO on their own. At a minimum, all three of the above threads need to be in place to achieve a successful digital transformation effort. The need for first two threads are generally widely understood at the board- and ‘CXO’ level of firms. But here’s the question: what are they doing about business agility and complexity management? The answer is buried in the murky world of ‘enterprise architecture’, a discipline which has never quite settled down into a steady-state agreement of what it is or what it should focus on, or who should be accountable for doing it. Business agility requires agility in its technology. The way to achieve and maintain agility is through managing complexity *continuously* – the complexity of business processes, and complexity of the supporting IT. A proven way to address complexity is to partition or modularise activities, from the enterprise all the way down, and to establish principles for identifying partitions and for governing change within and across partitions. This requires new practices and skills which are specifically focused on these principles. These may be skills more mature IT organisations may have, but the practice is a business-technology endeavour: in the end, in the same way the CEO demands focus on customers and data, they must also demand business agility and hold their business and IT to account for achieving that. An excellent book on this topic is Roger Sessions ‘Simple Architectures for Complex Systems‘, some of which ideas will feature strongly in future posts. A related enabler is the ‘Scaled Agile Framework (SAFe)‘, which drives business agility goals into execution of projects and programs.